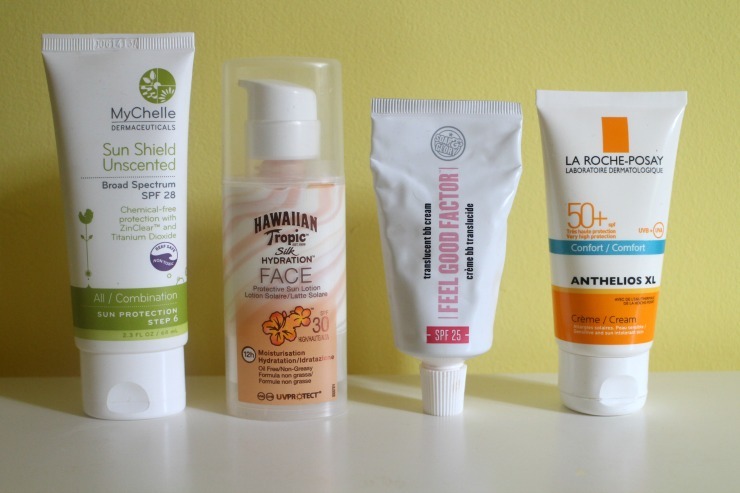 I only have four favourites for you this month as July has been one or sorting through and testing products. Obviously there are some highlights from there but also it's meant that reaching for the same thing repeatedly has been limited. That said this month my morning shower has been given a tropical burst with Radox Mango Mayhem* shower gel. Whilst I love my L'Occitane Almond Oil it's a killer to any self tanning I may have done the night before and sometimes you just need a little fruitiness in your mornings. The mango scent is so refreshing especially after a long humid nights under the duvet and I can also recommend giving the Passionfruit version a whirl. 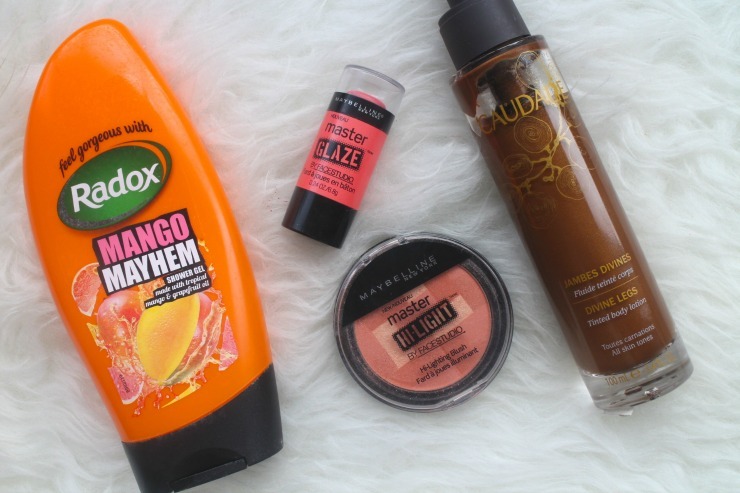 Two favourites from Maybelline this month which I had to consciously remove from my make up bag to give other blushes their face time were the Master Glaze Blush Stick in Coral Sheen and Master Hi-Light in Coral. First I swipe the blush stick across my cheeks and then I add the Hi-lighting Blush which works both to set and highlight the cheeks. The look is perfect and I will be adding the pink-rose version of the blush to my US shopping list. You can read a full review of the blush sticks in this post. My final favourite is the popular Caudalie Divine Legs tinted body lotion. I have had this in my collection for a ridiculously long time and always been scared of it. Finally I took the plunge one risky morning after forgetting to tan the night before and shocked at the sight of my pasty pins. This is so easy to use and gives a subtle colour to the skin whilst moisturising them and giving a lovely shine and a scent I adore. I have applied this with both hands and mitt but prefer the mitt for keeping the hands in check. For a lazy girl like me who can't always be fussed with overnight tanning this is a god send. A few weeks ago I headed along to a beauty showcase and came home with a rather amazing goodie bag stuffed to the gills with lot's to play with. 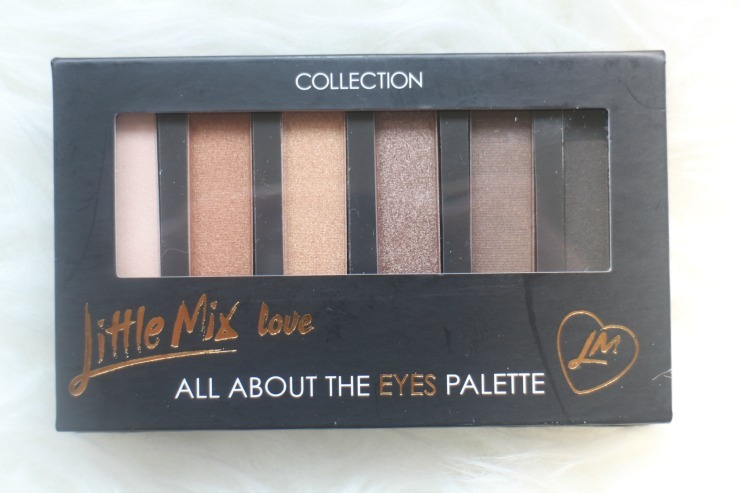 The first thing that caught my eye was the the gorgeous All About Eyes Palette from the new Little Mix Collection Cosmetics range. The palm sized palette comes in the standard Collection Cosmetics cardboard packaging which isn't to everyones tastes but I've thrown this into make up bag for the past couple of weeks and it's standing strong - unlike a Mac blush is barely salvageable but we'll save that story for another day. The packaging is rather sleek in black with gold lettering the gorgeous gold and brown shades are shown through which is something I like so I'm not opening and closing palettes whilst in a rush. On to the shades themselves which range from Feather the perfect highlighter to Blackbird which acts as a liner. In between we have Sunkissed, Golden Sand, Dazzling Brown and Cocoa Dream all lovely shimmery shades of brown and gold. 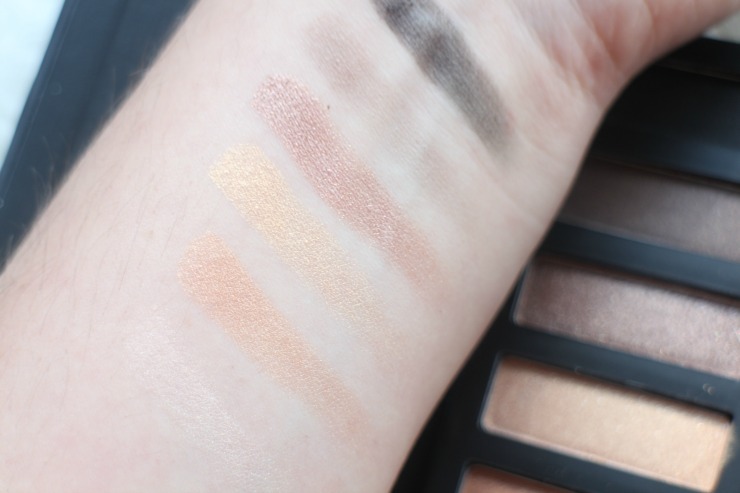 I haven't given this the full smokey eye treatment although the selling point of this palette is that it can be used for day to night. 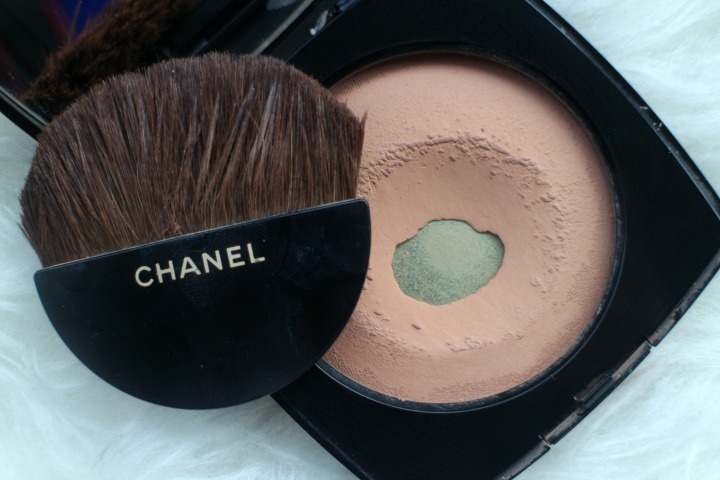 On a daily basis my favourite shades have been Feather, Dazzling Brown and Cocoa Brown. Cocoa Brown works as a subtle liner and Dazzling Brown is the perfect one colour shade. If I'm trying to jazz things up I'll throw Sunkissed or Golden Sand into the mix. The colours have nice pigmentation and can be built up depending on the intensity you require. I am one cursed with the oily eyelid so primer is a must for me with these shadows but otherwise the last well with minimal creasing at the end of the day and I can't argue with that for the price point. 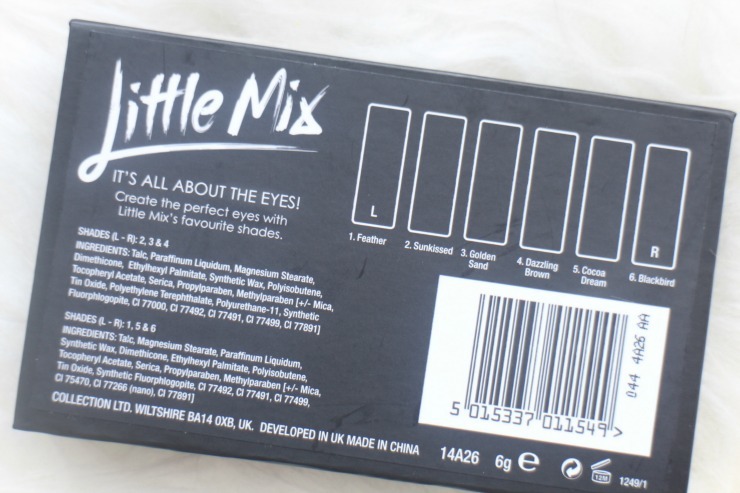 The Little Mix All About Eyes Palette is released in Superdrug stores today. 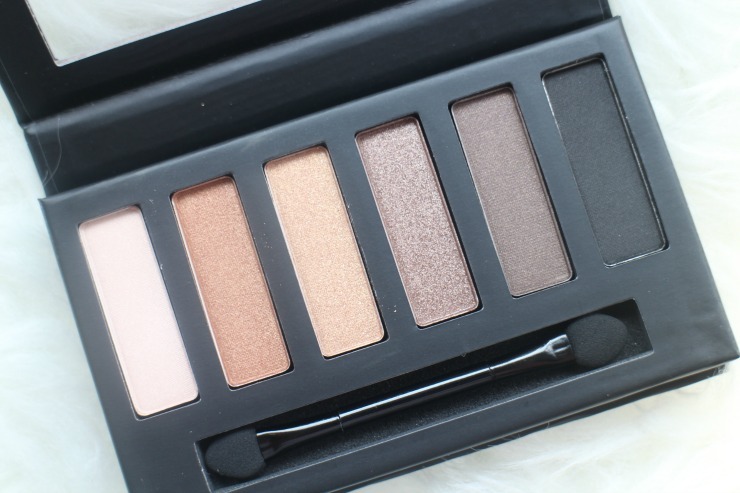 What do you think of this palette, are you tempted to add this to your Collection? My bedroom is once again having a makeover and furniture is being sold and new items ordered so I am once again I'm trying to use up what I own rather than add more to the piles whilst I struggle for storage. This of course means once again we have a bumper number of Empties posts for July so let's dive in to Part 1. Like many body lotions are something I'm rather lazy with so I jumped on the Vaseline Spray & Go bandwagon hoping for quick alternative on rushed mornings. A nice product although I found that I would literally spray and go rather than rubbing into the skin like I would with a traditional body lotion. I found I'd have to be quite liberal with the spray to have sufficient coverage and moisturising of the skin. It was ok but not something I'll repurchase. That scent the famous Cocoa scent is amazing as always. A favourite product of mine I use daily after VO5's amplifying blow dry lotion. It amuses me no end that mousse is a daily product of mine being a child of the 80's who remembers sticky mousses that would turn your hair to a rigid mess. This is the complete opposite, non sticky and really weightless even in my hair that can turn to a greasy mess with the slightest incorrectly formulated product. I have already repurchased. Having come to the end of my beloved Dryspun Finish and yet to repurchase I am missing it greatly and on the way to giving it holy grail status. 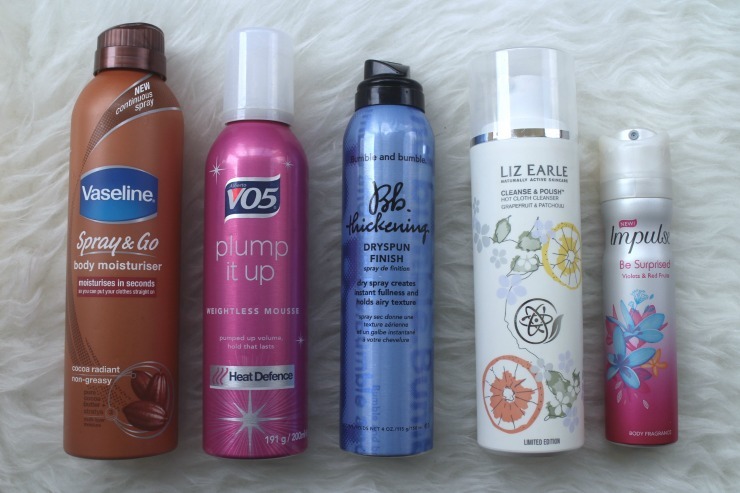 I had a can of the Charles Worthington Texturising Spray which I wanted to try before repurchasing and as you will see in my 'Products that didn't work for me' post I was not a fan. I love the volume this gives my hair and such an instant boost especially after the end of a long day when you're popping out for drinks with friends. 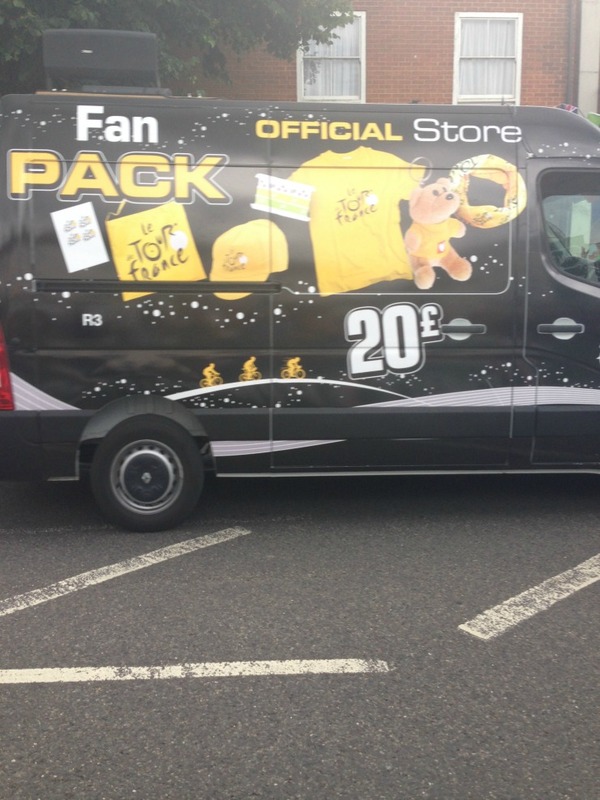 One such friend actually used this prior to us heading out and asked 'what is this amazing stuff'. Cue me heading over to Boots to repurchase immediately. Whilst a fan of the famous Liz Earle Cleanse & Polish I'm just a bit blah about it's original scent and as a lover of anything grapefruit-y I was really pleased when this limited edition scent was released last year. 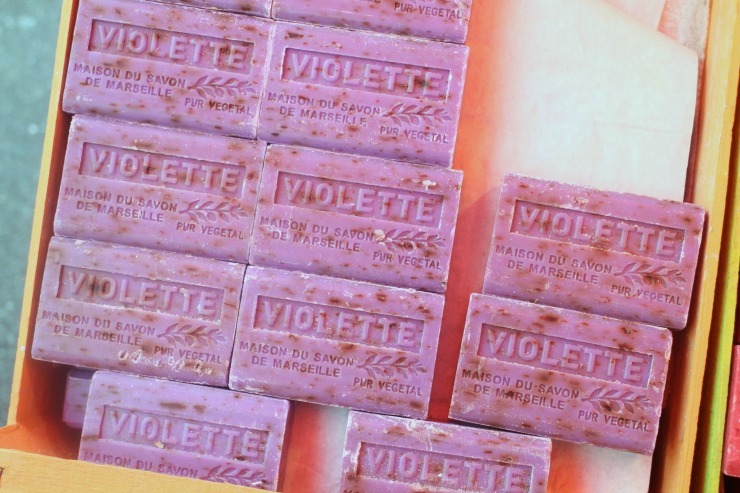 It was definitely a favourite part of my morning skincare regime (which you can read more about here) and I'm very disappointed it's come to an end. I have a can of Impulse in my draw at work and another in my bedside cabinet at home. At work it's the perfect addition on days I've forgotten to put perfume on and at night when I want to wear a scent but not waste my perfumes. Yes it can have a slightly artificial scent on it's first spritz but the scent settles quite nicely. No it's not going to stick around for long but in emergencies it's a cheap alternative. I can't quite make my mind up about Primers. As you can see I have a small collection but I can't quite decide whether they actually serve any purpose so last week I put them to the test to see whether they are worth my time and gave any support to the super sweaty weather we're having. I've used Laura Geller products on and off for years thanks to her home on QVC but strangely enough Spackle was something that only came into my possession following a blog event. Compared to a lot of primers this is a rather hefty tube and of course comes with the extra roller tip for cooling. I don't really get this addition if I'm honesty, it makes things rather messy and who has the time to sit there rolling their face in the mornings when priming? That aside the texture of this product is nice in that it's a gel and has less of the silcone-y feel from many others. I asked a friend at the end of the day whether she could see any difference in my make up and she did point out the correct side but admitted there was only a slight difference and that was because she was looking for it. I was interested in trying this product on it's release and luckily it came into my hands via a friend who had brought it and wasn't a fan. I find this comparible to Benefits poreFessional in texture although it seems more greasy. It certainly smooths out imperfections and provides a nice base for make up but you are almost aware of it on your skin. A mention also must be given to it's 'squirty cream' distribution from the bottle. I'm sure I've sprayed more of this product on my mirror than on my hands/face. Having used a different primer every day last week whilst preparing for this post I think this is a close favourite to Benefits thePOREfessional. It feels more like a light serum going onto the skin rather than the other primers I've tried in the past. 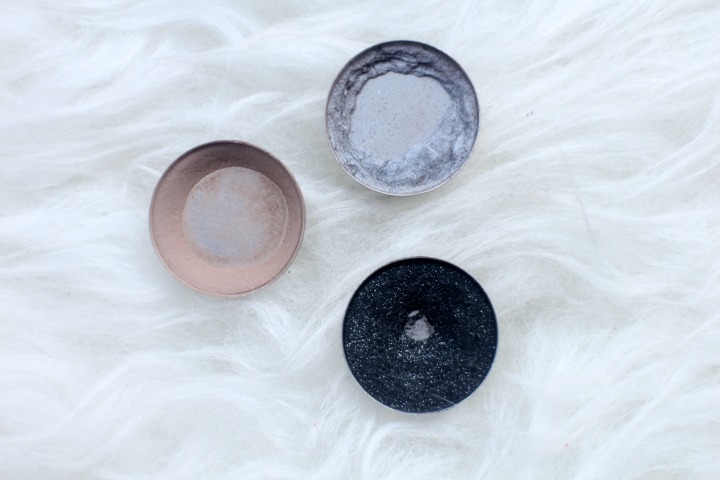 I found little wear to my primed side of the face and it certainly added longevity to my make up even after last weeks hotter than Ibiza days. I've learned to live with the fact I have pores that no one else pays any attention and there's little I can do about them but I originally purchased these product with unrealistic expectations that it would change my life and make them invisible to the eye. Whilst that would a stretch too far this is a fantastic primer to blur out the perfections and the longevity it gives my make up is outstanding. Benefits thePOREfessional is my go to primer for nights out and as I near the end of this tube it's definitely going to be one I repurchase. Murad's skin perfecting primer is another hit for me. Similar to Benefit Murad had a slight colour to this product which for the braver amongst us might just give a sufficient base to start their day. I still applied my usual BB cream but as I was happy to walk to the station with only a covering of this before I had time to apply a full base. Again I found that make up had good longevity if not much different from my unprimed side. 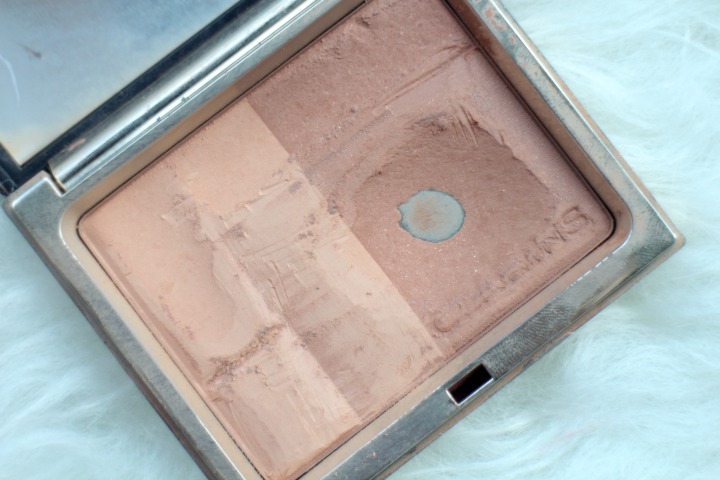 For some reason I've yet to try the Hourglass Primer despite owning it since I purchased the Hourglass Ambient Light Palette in Las Vegas last year. Maybe I'm worried I'll like it too much and have to pay the price - literally. So this is on my yet to try list and I will report back whether it's a hit or miss. So after that mini testing session what are my thoughts on primers? If I'm honest I'm still not completely swayed but there are a couple in my arsenal which I'll continue using. I think I'm happy with the actual 'priming' aspect rather than expecting it aid my make up up staying on my face hour after hour. 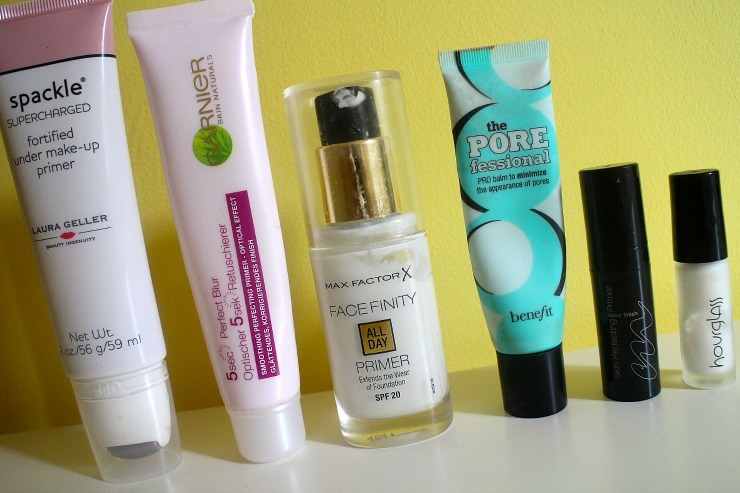 What are your thoughts on primers, are they are faff or something you couldn't live without? 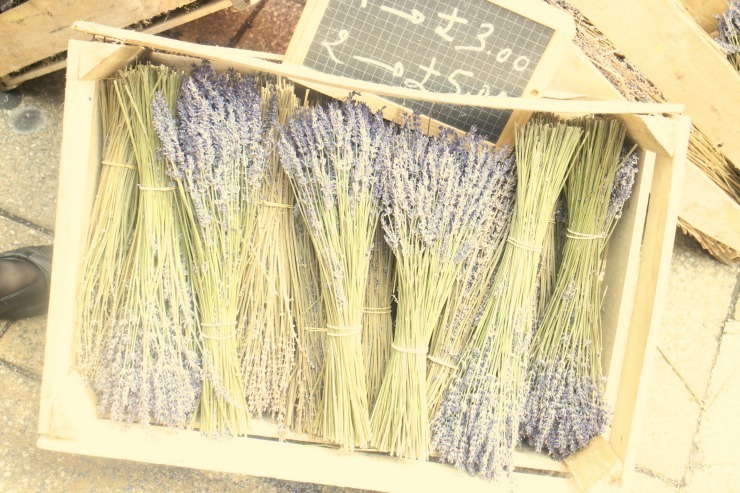 Love them or hate them one thing you can't argue with Benefit about their amazing marketing campaigns and savvy at ensuring bloggers are armed with any new releases ready to tempt us before the products hit the shelves. Obviously talk at the moment is about their new 'Criminally Easy' Gel Eye liner (which I've yet to try) but today I'm returning to a launch a few months back which caught my attention, Benefits Big Easy. I'm a fan of lighter basis a you know so Benefit's foray into this arena was of interest to me. Luckily when I was in America back in April one of the point perks at Sephora was the Big Easy in a small 3ml size which I was able (due to excessive spending) to pick up on three occasions. I actual dabbled in wearing this base whilst away and enjoyed it but on my return I found that it didn't provide the coverage I would like. A few months later and with heat to rival Hawaii I thought I'd give it another go and the love affair is reunited. So I'm sure you already know that this is a liquid to powder finish, oil-free formula and matte finish which makes it perfect for the current heat we're experiencing and the SPF35 helps. I popped this on one Sunday when I was heading to my parents for a run around in the garden with my niece and nephew (who else remembers What's the time Mr Wolf?) and I have to say where many basis would have an added sheen to them Benefit's Big Easy remained matte and it's oil control claims received a tick from me and of course this means that hours late the product is still in place. 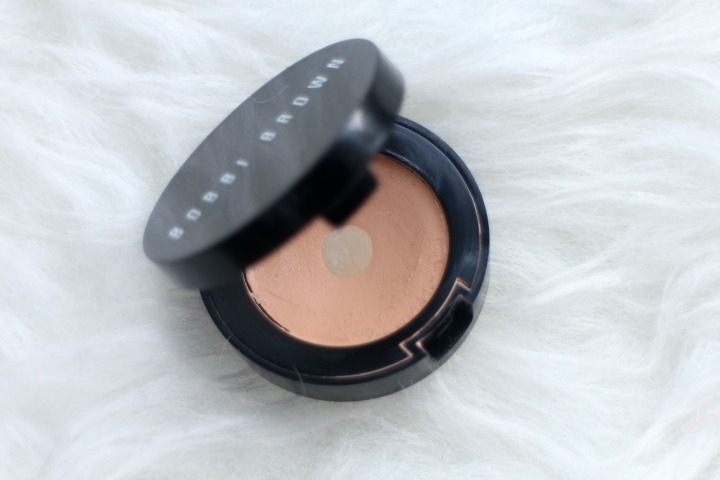 If I was to be critical the coverage is very sheer and less so than my favourite Erborian BB Cream which I've reviewed here but that makes it perfect for weekends when I'm looking for not so much a no make up look, but one that is more natural with a bit of help. Obviously being a Sunday and brush cleaning day I slapped this on with my fingers (as I do with Erborian on lazy days) which worked well and I imagine with a brush and some more effort I could give myself an even better finish. I would say Benefit Big Easy is the perfect light base for any oily skinned girls heading off on their holidays who want freedom from a heavy coverage but still require a little something to get them through the day. 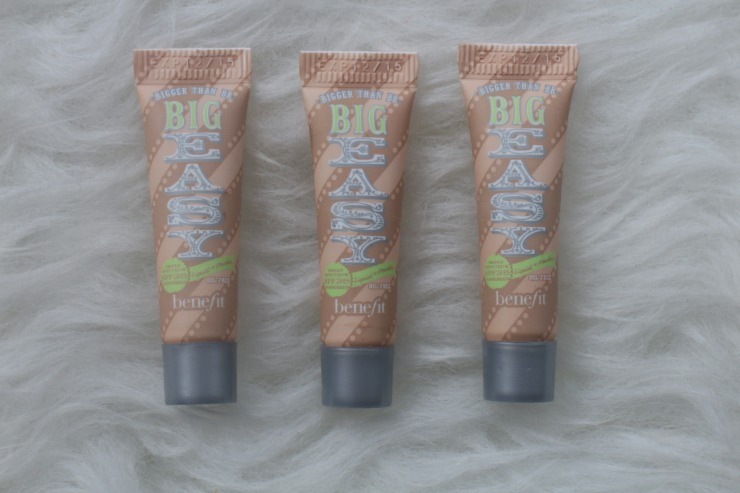 Have you tried the Benefit Big Easy or even tempted? One of the reasons I have been absent from my blog of late is due to spending a lot of time with friends and family, the great news is there are some great lifestyle posts ahead the bad news is that some of those days out take up blogging time and of course may leave a lingering hangover the morning after. 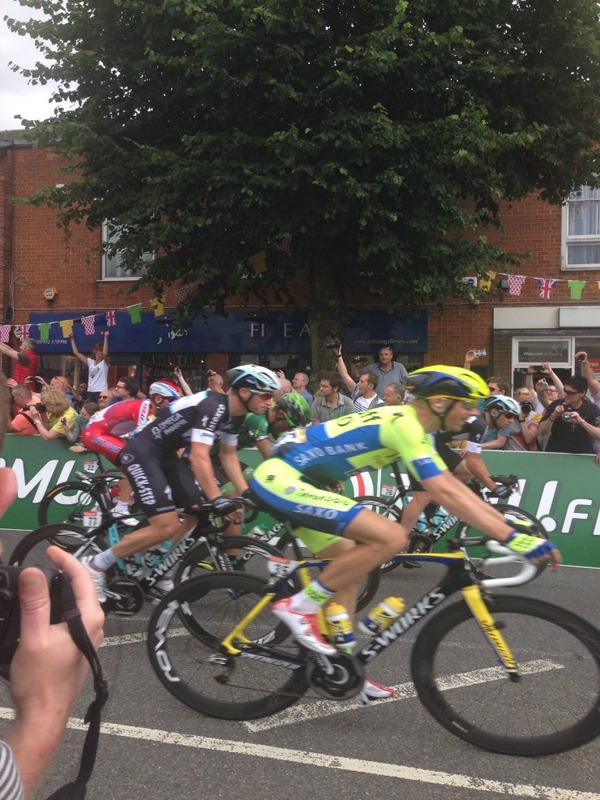 One such activity was when the Tour De France came to Epping my hometown. I may not have any interest in cycling itself but when there's an excuse for a Monday off of work and to see the local high street filled with people how could I not participate? 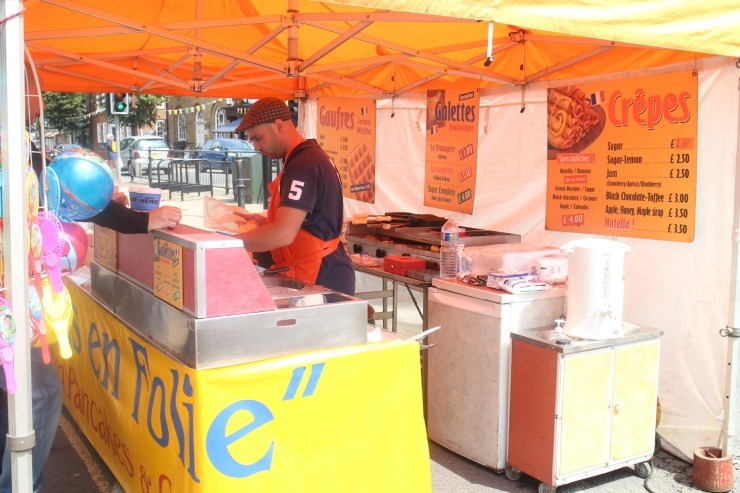 The weeks leading up to the Tour De France hitting our often quiet town meant signs were appearing, complaints about road closures were voiced and bunting was hung. Ben and I enjoyed a drive through the high street Sunday evening watching workers piling barriers along the streets in preparation for the next day. 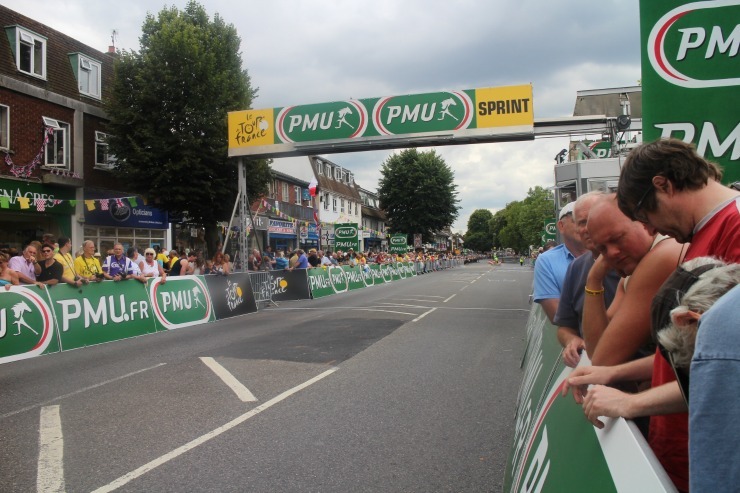 The cyclists were not due to hit Epping until around 2/3 but early morning with the sun shining Facebook status were filled with pictures of streets quickly filling up with local residents reading to watch a piece of history. I arrived in to the spot secured by Ben and his mum around 1130pm and both were well prepared, his mum with her seat and Ben with the more important flask of Pimms. The atmosphere was fun (if not lacking any music) with people chatting as we waited - we found ourselves with a 90 year old man and a couple of gents, one who had travelled from Cornwall. Soon the 'carnival' started making it's appearance, unfortunately it was more vehicles who sped through the high street throwing out Yorkshire Tea, Fruit Shoots and the like - it was a shame they weren't a little slower for us blogger types to take some photos. Thanks to the age of smart phones I was able to bring up live action so we could have an idea of where the cyclists were and my mum was asking for updates at her spot outside a friends further along the route. After four hours of standing around and Pimms drinking the cyclists appeared in the distance and whizzed past in a matter of seconds if not minutes. It was amazing to see how quickly workers stepped in and started removing signage and packaging as we did what anyone would do after such excitement - hit the pub and BBQ. 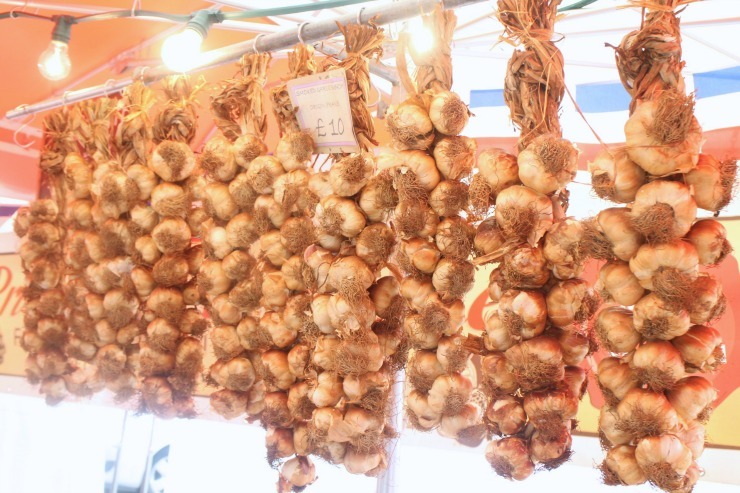 If that wasn't enough oh la la for one week the following Saturday we stood host to a French market. Despite warnings of rain the sun was shining and mum and I had a lovely stroll through the high street buying French soaps, cheeses and sweet treats. 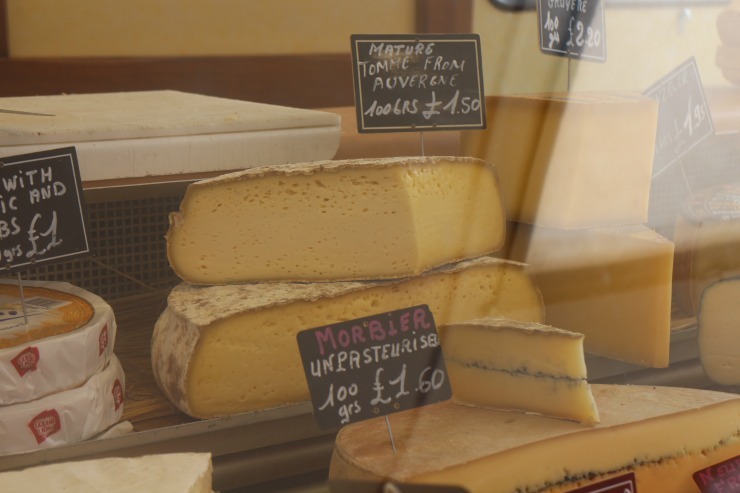 Who needs to cross the Channel for a taste of the French? 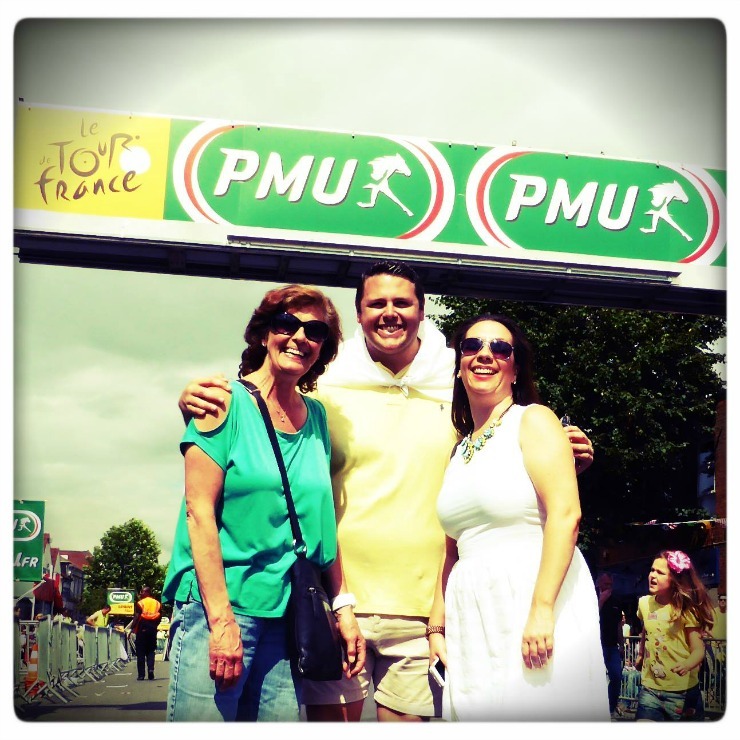 I hope you enjoy some more photos from my faux French adventures. 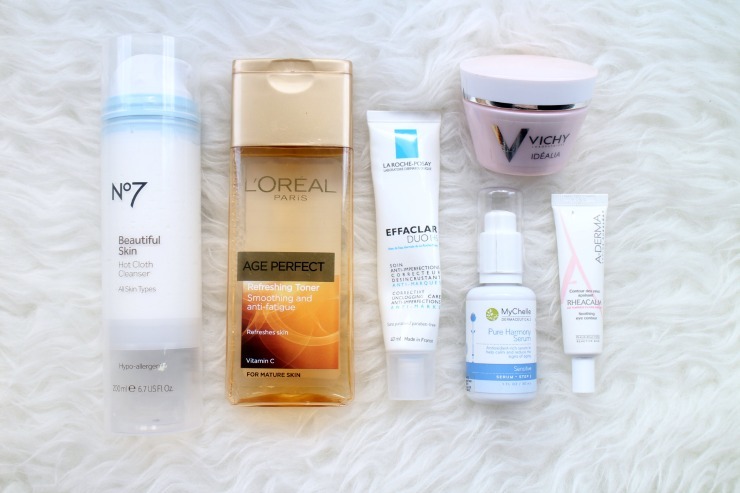 I've been having lot's of conversations recently with friends and family about skincare regimes of late as well having the opportunity to try out lot's of new products. 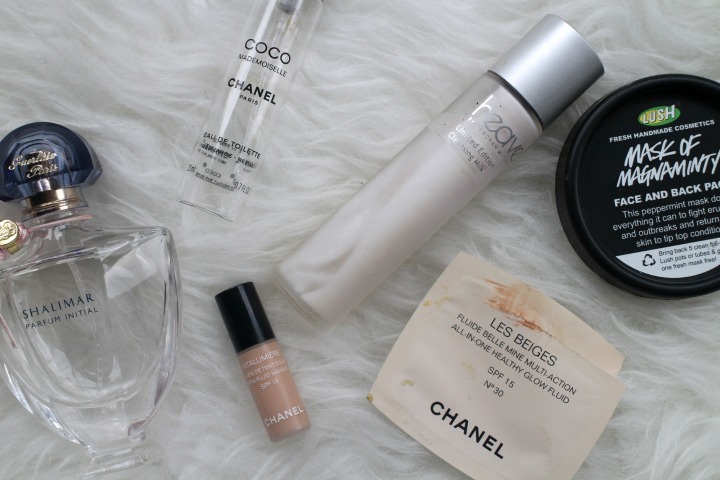 Before it's time for a switch up I thought I'd share with you what products make up my morning ritual. I enjoy the morning wake up call of a wash off cleanser and have one or two that I chop and change between depending on mood. As my Liz Earle Limited Edition version will be popping up in my next Empties post I thought I'd mention again No 7's Beautiful Skin Hot Cloth Cleanser which I have also reviewed here. I find this a great alternative for a cheaper price tag and for those who enjoy the 'clean' type of fragranced products this will be a hit. Another major plus I love for this bottle is you can see how much is left and when it's time to replace. Too lazy to walk to my nearest Liz Earle stockist and replace my favoured Skin Tonic I decided to browse the aisles of Boots and see what was available to me. I was impressed with L'Oreal's micellar water and when I saw it's toner for 'mature' skin boosting Smoothing and Anti-Fatigue assistance I thought this is the one for me. I rather enjoy this toner particular it's somewhat manly scent although if I'm honest I'd prefer something a little more refreshing in smell of a morning and I will be making that walk to pick up some Liz Earle. As a night time toner this fits the bill perfectly and I gave myself a pat on the back when Caroline Hiron's mentioned this in a recent drugstore skincare video recently. For someone who complained about dark circles being their thing in yesterday's post it's somewhat surprising that I've always been lax with eye creams and such a shame that using them has improved the appearance significantly - if only I'd started earlier. I added this eye cream to my hand luggage back in April and happily have continued using it since. I use a heavier duty one at night time but this is the perfect light cream to brighten the area and not cause disruption to make up applied over. The Effaclar Duo from La Roche Posay is my holy grail product and one I've talked about before in this post. Without repeating myself too much my skin has been transformed by using this product. My first tube was used daily, now my skin is in better condition I tend to use sporadically to hold off any blemishes. I urge everyone to give this a try and see how it works for them. Serum's are a new arena to me and i have quite a few that have made their way into my regime, mixing them up based on my skins needs. I was given the MyChelle Pure Harmony Serum following my Skin Analysis at Whole Foods which you can read about here. This serum helps to calm and reduce the signs of ageing in sensitive and irritated skin types and I have certainly found that whilst my skin has never noticeably been sensitive it feels much calmer. It's a different texture to some of my other more thicker textures and not the most pleasant of colours but one small pump is all that I need to work into my face. I have never been wowed over by moisturisers until the Vichy Idealia Smooth and Illuminating Cream came into my life and I am really enjoying using it as my Summer, morning moisturiser. It seems obvious to me now that a lighter product would lend itself well to the warmer months and this fits the bill perfectly. There's almost a creamy gel like texture to this cream and on applying my skin looks wide awake and I'm quite happy to walk to the station bare faced before I set about applying make up on my commute. I also must give note to it's packaging which aside from being pink feels very old school glamour, there's just something about the pot sitting on the side which gives me visions of some 1950's housewife at her dressing table applying her creams.